What is the best .22lr rifle on the market today? This product is featured in: Which .22 rifle should I choose for rabbit shooting?, Is the rimfire .22 long rifle cartridge the top seller in the UK?, Weihrauch CW66 .22LR thumbhole – the perfect vermin gun?, and CZ 455 Evolution. The humble .22 rimfire rifle is fairly ubiquitous these days. Most gun cabinets will have at least one rimfire for pest and vermin control, but the choice can be bewildering between makers, let alone the choice within the manufacturer’s range. So what rimfire rifle should you choose? Heavy varmint barrel? Synthetic or wood stock? Perhaps a better trigger or the ability to change barrels and therefore calibres? The truth is you cannot go wrong with a .22 rimfire rifle, either new or second-hand. They are pretty hard-wearing, but I have chosen four typical rimfires for this comparison test that cover a range of desirable features and prices. Unlike full-bore rifles, rimfires tend to lock the bolt from locking lugs sited at the back of the bolt, not at the face as is conventional. 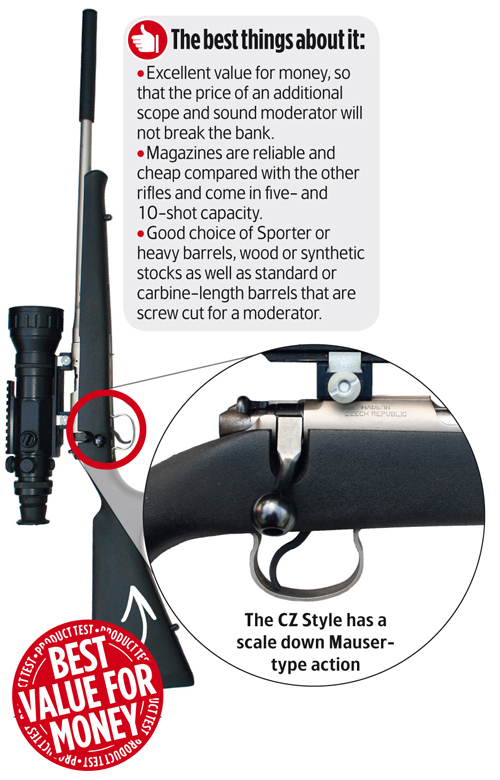 The CZ has a classic petite Mauser-design action and bolt assembly. The bolt is beautifully miniaturised to fit the .22LR cartridge with a short bolt throw, while the bolt has a twin extractor claw arrangement with a fixed blade ejector — it’s simple but totally reliable. The Sako’s action is reminiscent of the old Finnfire design, but modified for the new swift barrel release mechanism to accommodate four calibres — .17Mach 2, .17HMR, .22LR and .22WMR. The bolt is swift in operation due to the low bolt lift angle and short bolt throw, and the handle has a moulded plastic shroud with faceted edges for comfort and grip. Unlike the CZ, extraction is via a single extractor claw. Because all the four calibres share the same rim dimensions, extraction is good. The triggerguard is a polymer-moulded unit, which is a pity as I would prefer metal. Again, the Ruger uses a steel action though stainless-steel options are available. There are three integral proprietary scope-mounting slots to the top of the action. The bolt is quite large for a rimfire with a length of more than 6in (the CZ is 5in). In two halves, the front half of the bolt has twin guiding rails to stop it binding in operation. There are two opposed extractor claws that ensure positive extraction, while the rear section of the bolt has two large locking lugs that lock down vertically and solidly to the action. The bolt handle is short with a polished semi-round knob, nicely raked for a firm hold. The Anschutz XIV is the match-grade Model 64 from its target range. This is beautifully made, ensuring smooth operation and reliable feeding coupled with positive ignition. The bolt is light with twin extractors that provide positive case extraction. The ejector, sited in the bottom of the receiver, energetically clears empties. You do not see that many Rugers for sale secondhand. This is probably because their owners appreciate their fine construction and simple, plain accuracy. As with the CZ 452, they seem to mature well, by which I mean the action becomes smooth with a bit of use. The only down-side is that you have to use its own scope mounting system, though a Ruger to Weaver basemount conversion makes it more universal. Firing-pin lock times are quick which enhances accuracy, while the bolt lever has a large, moulded plastic knob. Practical on a vermin rifle, it is positive and fast for follow-up shots. The trigger unit can be the key to a rifle’s accuracy and is often overlooked in favour of a fancier stock or better scope. All four rifles have good triggers, but certainly there is a hierarchy of precision. The CZ unit has a slim trigger blade, and though there is an adjustable trigger the CZ would benefit from a lighter pull. Nevertheless, most people will be happy with the factory unit. Similarly, the Ruger’s trigger is absolutely fine as set at the factory, albeit a little on the heavy side. Alternative trigger units are available, such is the popularity of the rifle, so drop-in units from Rifle Basix or a rework by a good gunsmith would present little difficulty. 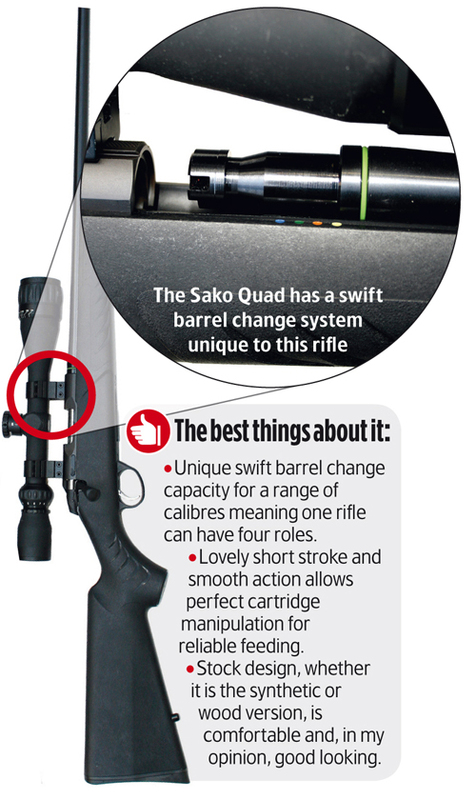 The Sako’s trigger is certainly a step up in refinement, with a feel that will help eke out every last bit of accuracy. Though I still miss the old Finnfire design, the Quad takes the .22 from Sako to the next level in terms of versatility in its quick barrel-change facility. The trigger-blade is also slim, but good nonetheless. Single-stage in operation — as are the other three triggers — it is predictable and its let-off is crisp. Top of the group by quite a way is the Anschutz trigger. Fully adjustable, it is set at 1.2g weight at the factory, but can be adjusted if competent to do so. 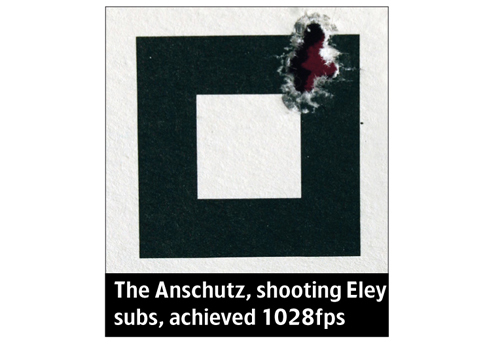 It is pleasant to use and contributes to the Anschutz’s great accuracy. The CZ, Sako and Anschutz have options of five- or 10-shot detachable magazines. Ruger’s rotary magazine is only available in 10-shot capacity. Though the rating is 4 the CZ 452 series is probably the best loved and prolific rimfire rifle out there and has served its owners incredibly well. There is a greater range of styles available and they are virtually indestructible. Though the 452 model has a slightly heavier trigger, this new unit has a new feature to the Brno range with a trigger-guard that, when set forward, gives the trigger a lighter pull weight. Each works well, but there’s a big price difference for spares. Only the Anschutz is all-steel — it’s also the priciest to lose. Stock choice allows for all tastes, be it the practical synthetic route or plain sporter beech up to varmint-profiled stocks and quality walnut. CZ has some really nice walnut on its rifles and the chequering is always well cut, though the Style’s synthetic black stock seen here is sturdy and perfect for rough use. So too is the Sako’s polymer stock with angled finger grooves instead of chequering, though their walnut stocks are pleasantly heavy and balance well. Ruger rimfire stocks are always elegant, but its black plastic or laminated models are for those that use rimfires daily. Finally, Anschutz only offer wood stocks in this range, which is a pity, but the stock on the XIV rifle is a classic sporter style. It’s a bit plain, but nice to handle. As with CZ, Anschutz offers a thumbhole stock version which looks fabulous and gives a good grip, especially when lamping in a 4×4. The rimfire industry has suddenly woken up to the fact that most people in Britain cut off at least 8in of barrel to retro-fit a sound moderator. Anschutz first offered the 14in short model. 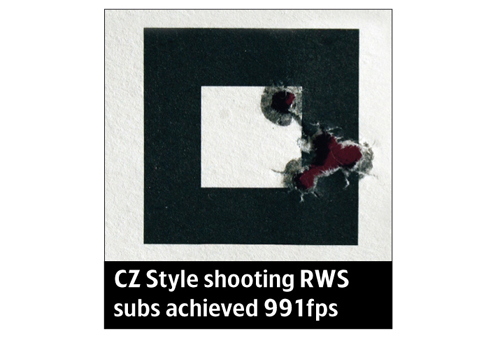 CZ soon followed with the 16in barrel range. 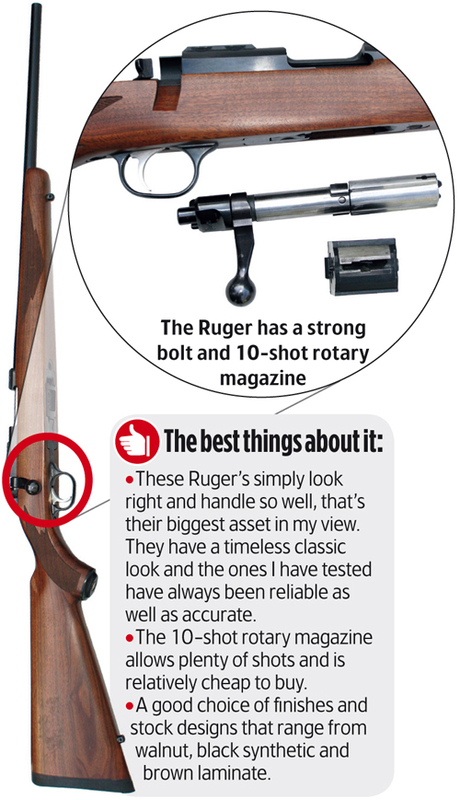 As yet, Sako and Ruger still only sport standard length barrels but they are now all screw-cut for a sound moderator. Sako, Anschutz and CZ all offer barrels in sporter and heavy varmint profiles if you desire, and though .17HMR versions of the same rifles are available within each manufacturer’s range, it is only the Sako that has a quick-change facility. A swift unscrew of a single securing clamp and the Sako can fit any of the .17 Mach 2, .17HMR, .22LR or .22WMR barrels so any vermin can be engaged. Nearly all the rimfire rifles on the market today are of such a quality that they will easily harvest a rabbit at 50 yards — much depends on the style you like and how deep your pockets are. 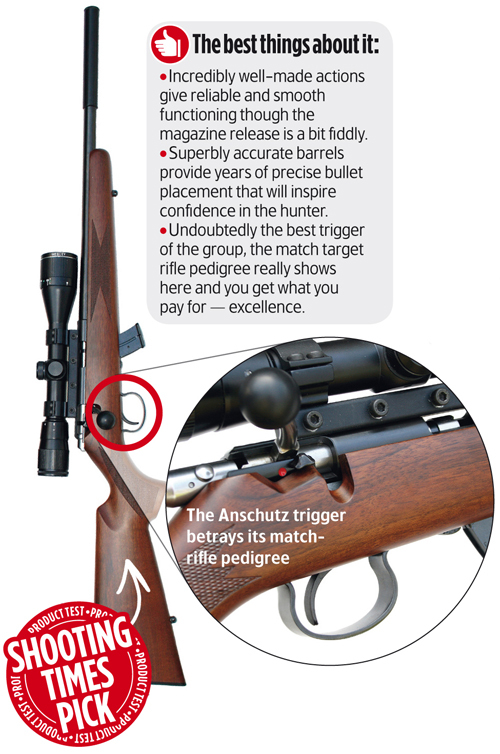 The Anschutz stands out as a superbly made and accurate rifle with the best trigger and accuracy in the test, but the lack of a synthetic stock might be an issue to some. 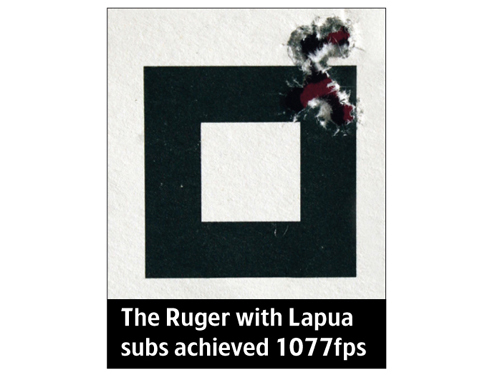 The Ruger is great for those who do not want the run-of-the-mill rimfire. You will certainly not be disappointed. 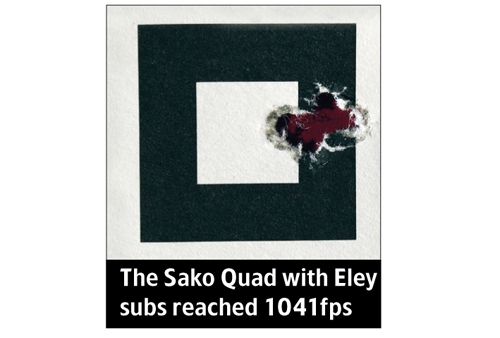 Similarly, I like the Sako Quad. The four calibre barrel-change facility makes the .22 rimfire into a short-range fox rifle if you choose the replacement .22WMR or .17HMR barrels. The CZ offers the best value for money and is the most widely sold of the rifles on test. They are accurate, available in many styles and stock choices and are near bombproof in construction. Any way you look at it, the local vermin will not want you owning any of these rifles!